Friday September 19th, 2014 marks a milestone as it will be the 10th in a series of carcass deployments in the Salish Sea. 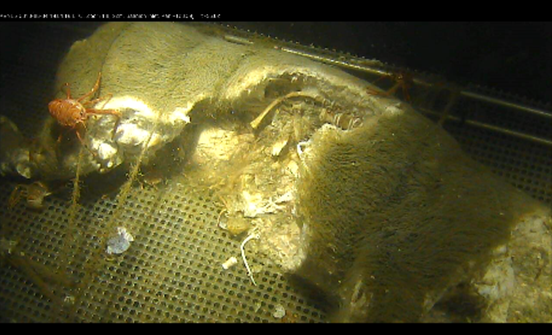 Almost a decade ago, Dr. Verena Tunnicliffe saw me give a talk at the University of Victoria on forensic entomology and she invited me ‘on board’ VENUS to deploy a pig carcass as a human proxy under a camera at the bottom of the Saanich Inlet. I was the first external researcher in VENUS. No-one had ever been able to conduct such research – to observe in real time what happens to a body in the marine environment. That first deployment and the three subsequent ones were during an unfortunate time when a number of human feet in running shoes were washing ashore. These sad cases became a media sensation around the world, leading the media and the public to make unfounded claims of murder and dismemberment. 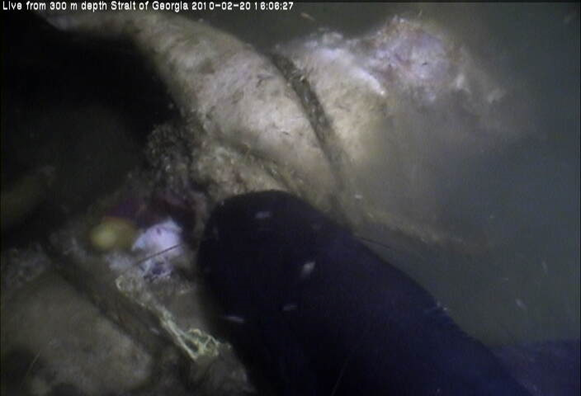 The early pig videos clearly showed the police and public alike that disarticulation of a foot is normal and common in decomposition in these waters (Fig. 1). These deaths were not foul play. My colleague Dr. Lynne Bell, a forensic anthropologist, joined the team in 2012 and, funded by the Canadian Police Research Centre and Department of Defence, we began the most recent set of experiments. Figure 1. Day 15 Saanich Inlet, Fall. Note legs becoming disarticulated. 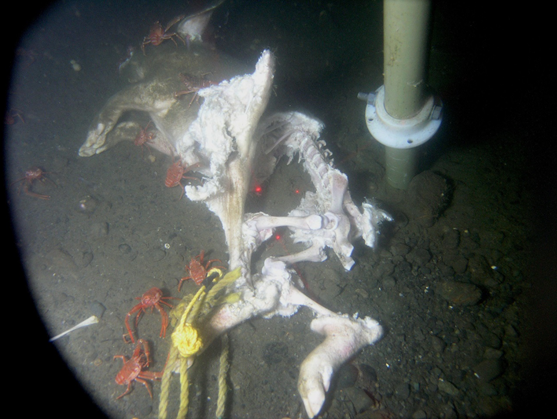 These experiments sought to explore the impact of marine submergence on decomposition, faunal scavenging, general taphonomy and bone macro and microstructure. As the abortive fourth deployment and first in the Strait of Georgia showed us, sharks are common and would eat the entire experiment if not protected! (Fig. 2). The VENUS team designed us a platform that would deploy two carcasses at the same time, one exposed, with the hope it would survive the sharks and one protected by wide spaced bars. The platform was also designed to collect the bones for subsequent study, when the platform was recovered. We are studying three sites, Saanich Inlet at 92 meters, Strait of Georgia at 300 meters and also at 170 meters, and deploying carcasses in both Spring and Fall at each site. So far only Fall at Strait of Georgia 170 meter site is yet to be covered – that will begin on Friday September 19th. Figure 2. Day 1 Strait of Georgia, 300 m, Spring. Hexanchus griseus the six-gill shark, destroying the experiment. We started in Strait of Georgia at 300 meters and it was instantly very exciting. Sharks everywhere but the design held and both pigs survived. 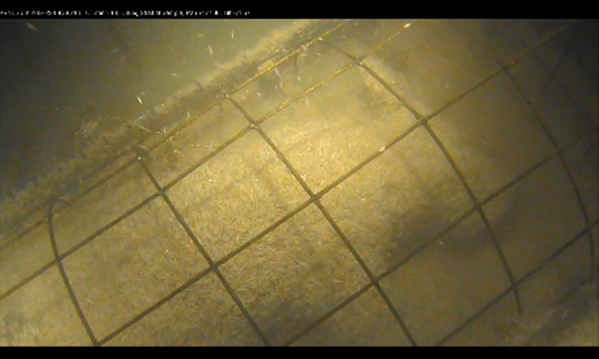 Then, what I had expected with all my underwater work, but never seen – mass scavenging by amphipods (“sea lice”) (Fig. 3). Figure 3. Strait of Georgia, 300 m, Spring. These skeletonized the carcases in four days! 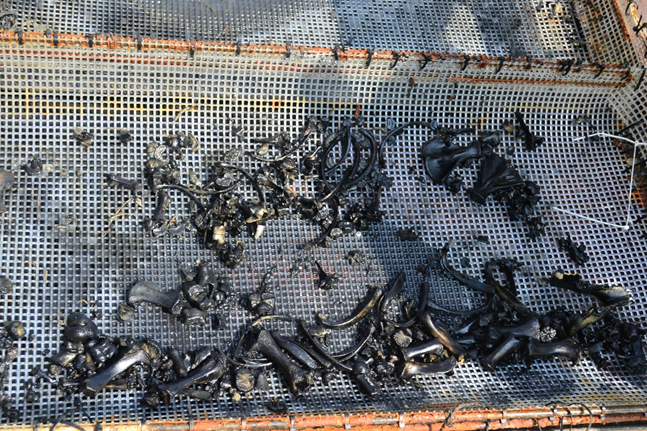 We successfully recovered every bone – and they had all turned completely black! (Fig. 4). Figure 4. Black bones after recovery from Strait of Georgia 300m, Spring. But once exposed to air, they reverted to bone colour. Ah you say, oxidation – once exposed to oxygen they reverted. But no. Lynne has refrigerated some of these bones and they remain black to this day. Lynne is investigating this. Strait of Georgia at 170 meters was similar, but the amphipods colonized more slowly and were never quite as dramatic as at the middle of the strait at 300 meters, and here were accompanied by Three Spot Shrimp (Fig. 5), but they still managed to skeletonize within 9 days. Although we had seen Saanich Inlet several times in the Fall, we had not deployed in Spring. Fall deployments were heavily impacted by oxygen levels and were almost all skeletonized slowly by Dungeness crabs, Three Spot Shrimp and squat lobsters, with amphipods only making rare appearances. 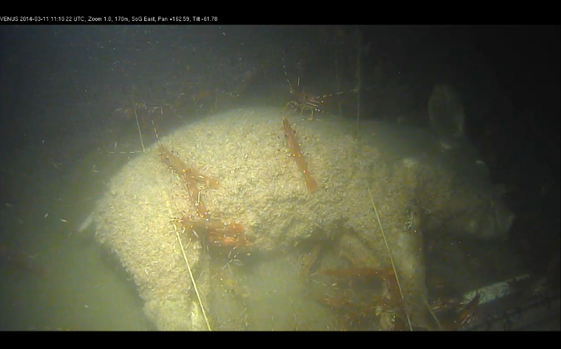 Spring however, was quite different with carcasses remaining intact for long periods even with adequate oxygen levels, and the carcass area becoming a squat lobster haven, with mass shedding events filmed at a level that had not been seen before (Fig. 6). Figure 5. Strait of Georgia 170 m Spring, Day 4. Amphipods and Three Spot Shrimp. Figure 6. Day 35, Saanich Inlet, Spring, 92 m.
Now we will see what Strait of Georgia Fall has to offer and then we will have completed an extensive and first ever underwater exploration of carcass decomposition in the Salish Sea. And then what you ask? - Our hope is to next go deeper into the Barkley Canyon with ONC and NEPTUNE observatory and discover what happens to bodies at greater depths and pressures.